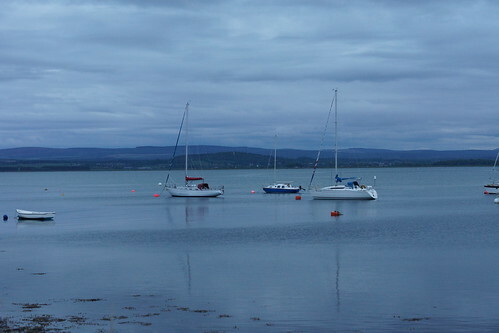 Raasay in Findhorn, a photo by ajax_pc on Flickr. Coming in was fine - the conditions were perfect, though. Almost flat calm with very little wind. The chanel had plenty of water in it - the shallowest sounding I got was about 1.7 or 1.8 metres (remember I was afloat at 1.4 when at anchor). Not a lot to play with, and I'd have been worried on a worse day. I do need to get an accurate check on the sounder depth, though. And, oddly, on the draft - if there really is additional ballast, then the draft maybe a couple of inches more than I originally thought. The standard R34D draft is 5'10", but the rudder tip should just be showing above the surface at this (courtesy of Michael Smith of the Rival Owners' Association). I think Raasay's rudder is fully submerged, but I will check at the weekend.